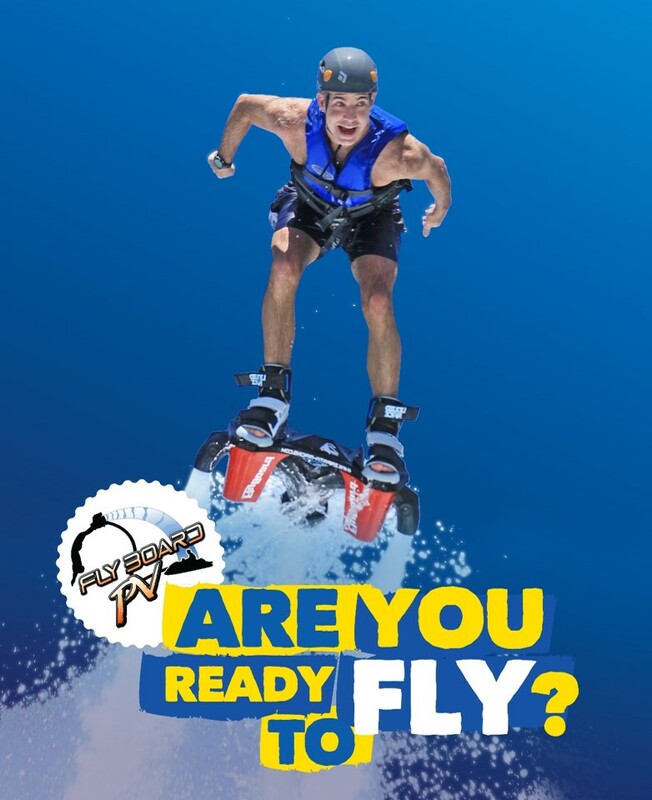 Puerto Vallarta, Mexico is proud to announce that there is a completely fantastic and sensational new water sport in town: Flyboarding! It’s now possible to glide through the water like a dolphin, and rise into the air and hover over the ocean like Iron Man. You’ll experience the amazing freedom of being able to free fly, dip in and out of the water at will, and land. 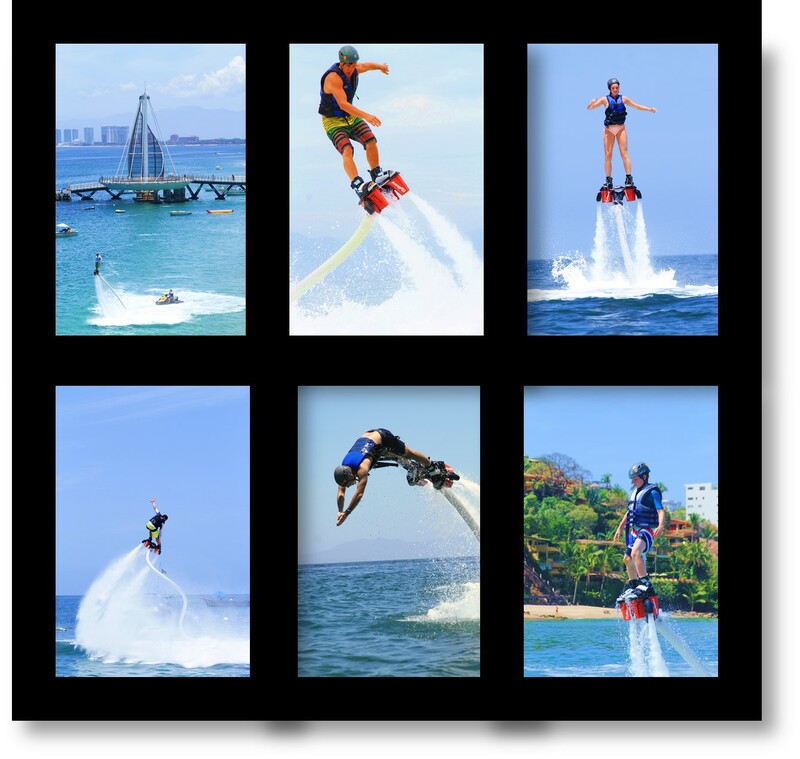 Hours of Operation: 10 a.m. – 6 p.m.
Flyboarding PV in Puerto Vallarta, Mexico. Arriving by foot: From the Los Muertos Pier at Los Muertos Beach, walk south past La Palapa Restaurant until you see the Flyboard PV reservations tent. They are located right in front of the Lido Beach Club. Arriving by taxi: Ask the taxi driver to drop you off directly in front of the Lido Beach Club. Walk straight to the beach and look for the Flyboard PV reservations tent right in front of Lido Beach Club’s chairs and umbrellas. The professional team at Flyboard PV stands ready to assist all visitors to Puerto Vallarta, Mexico in making exciting and unforgettable vacation memories. Once your friends back home see the fun images of you flyboarding they’ll be completely jealous. But then what can we say? Some things just can’t be helped! Blast out of the water and feel your heart beat faster and faster as you rise above the surface just like Iron Man. Test yourself and try some tricks – like fun dives, tricky turns or fun dolphin jumps. Flyboarding is an adrenaline pumping, thrill-a-second ride and the newest craze in adventure water sports. Don’t miss your chance to try it! Although it may look very “extreme,” flyboarding is actually easy to learn and loads of fun right away. The professionally-trained instructors at Vallarta Adventures will make sure you have a safe and amazing experience. Vallarta Adventures often offers special discounts of 15% – 25% when booking online more than 96 hours in advance of activity time. Activity often takes place in front of the Marriott Resort in Marina Vallarta, Mexico.